I had been a commander of a flying training squadron for a few months. One Monday morning I was getting ready to go into work when the phone rang. I put the phone to my ear and heard, “Where are you?” Have you ever had one of those moments when you come to the dreadful realization that you have screwed up big time? This was one of those moments. We’ve spoken many times in this blog about the need to have your own leadership philosophy, a written document that describes what you believe as a leader, your vision for the team and the team’s mission. This philosophy sets the stage for the two most important characteristics followers want in their leaders, credibility and trust. But, what do you do when you fail to live up to your own leadership philosophy? In a busy flying squadron, operations run quite literally from sun up to sun down. This meant that the work day would stretch from a couple of hours before sunrise to well after sunset. I was finding it difficult to find times on the schedule for squadron meetings (a time when the entire squadron would come together for a variety of purposes). The existing method of having the meetings on Friday afternoon was yielding less-than-satisfactory results. Turnout was routinely poor for various legitimate reasons. As the new Squadron Commander I had decided “enough is enough!” One Monday a month we would start flight operations two hours later to allow for a time when everyone should be able to attend the meeting. This Monday was the first such meeting. To make it even more special, we had scheduled an award ceremony for one of our troops who was to receive a medal. His wife had taken off work to be there and they’d gotten their children out of school to see the Squadron Commander, yours truly, pin a medal on their Dad. But the Squadron Commander had completely forgotten about the meeting and was still brushing his teeth! Should I have my Operations Officer fill in for me? After a couple of moments I did the only thing I felt I could do: I told my assistant operations officer to tell everyone to take a 30 minute break. I finished getting dressed, double checked my uniform and boot shine, and went in to face my troops. I led off that first Monday meeting with an apology to my squadron and to the family of the Sergeant we were going to decorate that day. I said that my being late may tempt some to think they might have a built-in excuse for being late as well; and then told them not to even consider it, because there was NO excuse for being late, not even for me. We went on with the meeting. We decorated our troop. We proceeded with the day. Did my credibility take a hit that day? Probably. But what about trust? None of us are perfect. 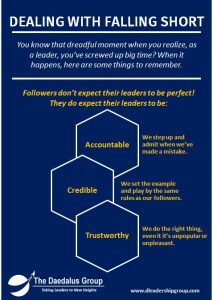 The good news is: followers don’t expect their leaders to be perfect. What happens to trust in a boss who doesn’t seem to think the rules apply to them? When your followers see that you will hold yourself accountable for living your leadership philosophy, trust can only flourish. And by the way, credibility will bounce back even faster too. When you stray from meeting your own standards, and it more than likely will happen, what will you do about it?